This is the last of the Germany flight posts and while the airplane was conventional all the rest of the flight was not. When I returned from flying the Katana my host at the Max Planck noticed I was beaming and asked about my morning. Much to his surprise he was immediately subjected to my usual torrent of aviation related information and trivia complete with hand motions to signify the most important aspects of the flight. I am used to folks glazing over after just a few minutes, an effect I enjoy because it usually means I can chat on for at least another ten minutes before their fight or flight response kicks in. Stas however seemed fascinated. After just a few really expressive hand dives with appropriate motor noises he asked why I had not asked him along. I allowed that it was just a two seater airplane and riding on the wing would be a poor introduction to this wonderful sport. As luck would have it there was only one more day of clear weather expected before the overcast that had been haunting Spain made it to southern Germany. I proposed we scoot over to the airport the next day and rent a plane. After all I had the FBO’s assurance that I could take one of their flivvers out for a spin after a checkout ride with an instructor. We arrived to find that this was not even close to the case. In spite of calling to confirm the facts of the situation it transpired that the Europeans take a dim view of an FAA license and will only allow you off the ground in a German registered plane if you have a JAA ticket. A bummer. There we were, at an airport but we could not fly. The checkout instructor could not take us up because he was on his rest period from his regular flying job. Another instructor could not be summoned for hours. Fortunately we looked appropriately disappointed and the check ride instructor Joachim decided he was willing to bend a few rules. We rented a Cessna 172 and Joachim agreed to take us on a forty-five minute circuit. Turns out this fellow in the truly worn leather flight jacket had over 9,000 hours and had been flying the Baden-Wurtemburg area since he was a fourteen-year-old glider pilot. I did not at first understand the true implications of either of these facts. Apparently my young nephew once told me he was depressed and asked what to do. My reply, though the exchange is gone from my memory banks, was to tell him that when I feel depressed I go do something truly dangerous and that always perks me up. Ride a motorcycle I told him, or climb a high tree, as long as there is adrenaline there can be no sadness. Said interaction took place in front of my sister-in-law who reminded me of the story at some point recently when I was surprised someone would call my good judgment into question. So, maybe it is not the perfect advice for a child, nevertheless I have been self-medicating myself in this fashion as long as I can remember. It means that I am nearly always happy and that rather than using adrenaline to chase away the blues I use it to elevate my normally upbeat self into euphoria. Poor Stas knew none of this. In fact, I do not believe that he fully comprehended just how recently I had been allowed to fly by myself. Somehow I think he got the idea that my grandfather taught me to fly, or that I had been at it at least since college. In any case, we boarded the plane and taxied out Golf to runway 07. Full throttle and we were climbing towards the Swabian Alps. 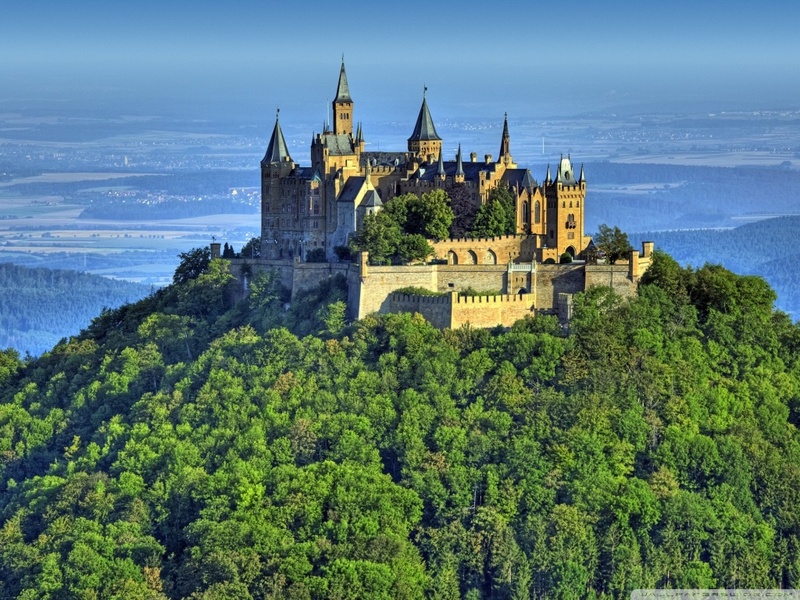 We headed down to the Hohenzollern castle as I had the previous day. This time we took a nice long look at an unusual glider field on a flat topped hill. Our arrival at the castle was heralded by the click and whine of Stas’ Canon digital SLR. After I took the plane around the castle twice I asked Joachim if we could get a little closer. His enthusiastic ‘sure’ inspired me to run a little wider on the next pass so I could edge in and do a straight flyby about two hundred feet off the building. It was very nice to be able to see all the dental work and full ashtrays in the castle courtyard. Next we north and east a bit to the Lichtenstein Castle. This a really pretty pile of a building set on the edge of a cliff overlooking a valley. I flew quite close this time, but Stas was not ready with the wide angle so he could get nothing but a picture of one of the windows, complete with an interested bystander looking out at us. Joachim offered to show me how to fly photographers so Stas could get some better views. We practiced on a cow. A steep bank turn, perhaps fifty degrees to circle the cow. Once it was well established ease out the ailerons and ease in rudder to compensate. The high wing of the Cessna vanishes from the viewfinder as the plane scoots around in a skidding turn. I remember something from the private pilot course about cross control stalls, but if Joachim is not worried, neither am I. We make another pass at Lichtenstein, this time sneaking up from the table land and pouncing at the very edge of the cliff. Joachim keeps his hands in his lap as I throw us around the top of the building in a horrid slip that gives Stas a great view. Joachim’s only comment is that ‘if you are not smelling exhaust you are not doing it right’. The exhaust comes straight back to the plane because the side of the plane, rather than the front, is leading the aeronautical parade. We could smell it. The last stop on the way back to Stuttgart was a pass over the glider field. On a Tuesday no one was at the field and it looked so pretty surrounded by the changing leaves of the unseasonably late German autumn. Actually, it looked rather like an aircraft carrier with the narrow well trodden track of the glider tow return worn into the grass all along the length. I asked if I could make a low pass, since it looked so nice. Joachim said sure, and once again showed his mettle by leaving his hands in his lap. I approached the field at about eighty feet above ground level (AGL) and as I cleared the first trees dropped down to fifteen feet. With the engine screaming full on we whipped across the top of that hill like a War Two night fighter was hot on our tail. The cabin of the little plane was loud with the theme from Top Gun (at lest in my head) as I pulled us up a the end of the field to clear the lovely trees. We did not catch a single leaf in the wheels, though it was not for lack of trying. As we returned to Stuttgart I managed to do an acceptable job of hitting entryway sierra and getting us established on the route to the pattern. The tower was their usual happy selves with exchanges of ‘gruss Gott’ and ‘Tcheuss’. There were two planes on long finals and it looked like we would have to do some circling to give them time to clear when the tower asked us if we could make a direct approach for immediate landing. Joachim looked at me and I immediately nodded hard. We were about a mile out flying straight at the center point of the runway. I put us in a slip to lose altitude and started inching a bit towards the numbers, not wanting to do other than a direct approach but hoping to get a little more runway in case something unfortunate happened. I got us to eighty feet above the runway as we got close and I started my turn. It was clear my turn was going to swing us wide and we would waste runway getting back and lined up. Joachim asked for the controls and flipped us up into a sixty degree bank, pointed the nose straight at the ground and said ‘your plane’. Apparently he too thought I had been flying for more than two weeks. I got the plane leveled out and we were ten feet up right over the centerline. I plopped us down and we had 200 feet before we were even at the far end of the 1,000 foot markers. All this time I had sort of forgotten Stas. It was such a wonderfully exciting landing for me, but I suddenly was reluctant to look behind. Fortunately Stas sounded okay when I asked whether all was well in the back seat. We taxied back to the hanger and tied down the plane. As we walked back to the FBO, Stas grabbed my arm and asked ‘are all small plane landings like that?’ I assured him that most are quite sedate affairs and that had I not forgotten he was there I would have gone the long way around and he could have enjoyed the approach. He maintains that it was great fun and that he was not at all worried, just surprised to be so very vertical so very close to the ground. He wants to take a flying lesson when he visits me in my lab. Not everyone would have that reaction. I got lucky. We returned to work and both of us did the data collection of ten men as the adrenaline powered a fine afternoon.